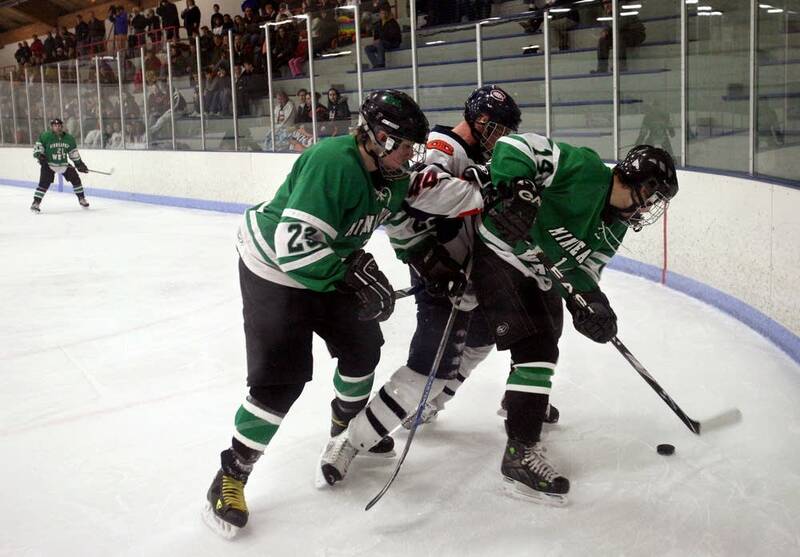 City teams used to be giants in boys hockey, but they've been declining for more than 20 years and there's little hope for a return to that heyday any time soon. The playoffs are underway in the world of Minnesota high school boys hockey and the state tournament is in two weeks, but it's very likely that tournament will not include any team from Minneapolis or St. Paul Public Schools. Tom Younghans played six years in the NHL, most with the North Stars in the late '70s. Now that he's a coach and delivers, instead of receives, the kinds of locker rooms speeches he used to hear as a player. "We can beat this club, I'm confident," Younghans said to his Minneapolis West Mustangs just before their first playoff game Tuesday night in New Hope. "I know it can happen; you just have to believe in yourselves. Go out and prove you can do that." His confidence then appeared to be slipping a few minutes later on the bench. "What are you guys doing out there?" It used to be, every high school in Minneapolis and St. Paul had its own hockey team. But now, there are only enough players at the 14 high schools in Minneapolis and St. Paul to field four teams: Minneapolis West and East, and St. Paul Johnson and Como. The West Mustangs went 7-18 this regular season, much better than last year's 1-24 showing. "If you look at St. Paul and you look at Minneapolis, the players aren't there anymore," Younghans said. "We don't have the numbers; we don't have the quality we need, and so expectations seem to go down." 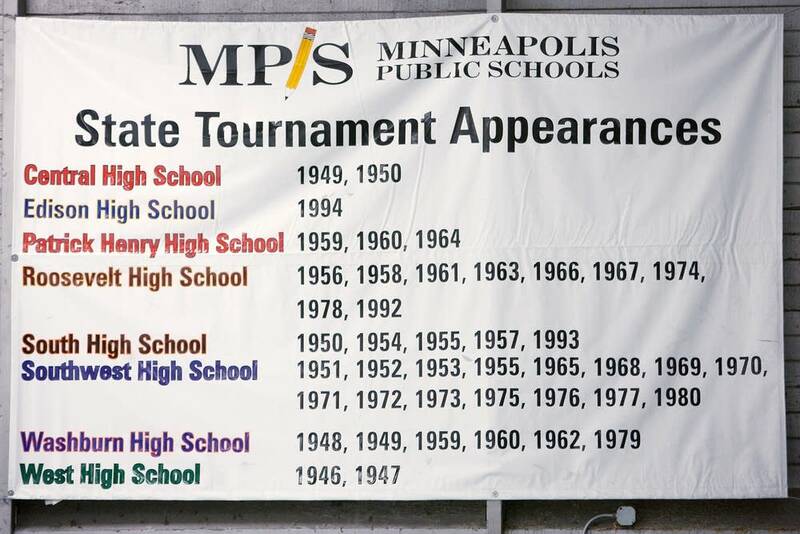 From 1945 to 1980, at least one Minneapolis or St. Paul team made it to the state tournament every year. Partly because there were so many teams, the playoff structure all but guaranteed a spot for each city. But there was an excitement to city hockey, too. Johnson versus Harding games in St. Paul routinely drew thousands. The late Dave Peterson coached two U.S. Olympic Hockey teams, but he's better known in Minneapolis for all those years at Southwest. City teams have won five state titles: St. Paul Johnson in 1947, 1953, 1955 and 1963; Minneapolis Southwest in 1970. But it's been 15 years since a Minneapolis or St. Paul public school played in the state tournament, a drought that once would have been unthinkable. Dan Pratt blames middle class flight for the current state of affairs. "As the population continued to move out, a lot of kids and families move out with them," Pratt said. Pratt is athletic director at Washburn High in Minneapolis. He also played on the 1979 Washburn team that went to state. Hockey players who live in the cities want to play on winning teams, he said, so they open-enroll in suburban districts or attend private schools. The last six metro-area teams to win state titles are all private: Hill-Murray, St. Thomas Academy, Cretin-Derham Hall, Holy Angels, and Breck. Joe Dziedzic sees this trend every day. He graduated from Minneapolis Edison 20 years ago but is still the most recent Minneapolis or St. Paul public school alum to go pro. 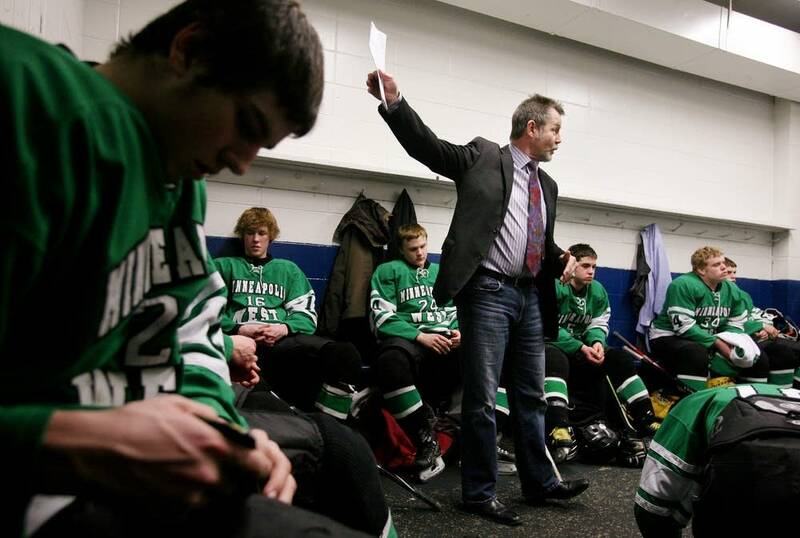 He now runs hockey camps where he sees the metro's up-and-comers. "Numerous players at different ages, whether it's junior high or even lower, that have already looked in their future and saw that they're the ones becoming the players of tomorrow and they're going to private schools,' Dziedzic said. Hockey has always been one of the more expensive sports to play--skates today can top $500, plus all the other equipment, camps, and ice time. And it's still a mostly white kids' sport, just look at any team's roster. So as the demographics of the cities change, the pool of potential hockey players also shrinks. One athletic director notes his school's high Hmong population. Hmong children grew up playing soccer, not hockey. But they are learning new sports, he said, slowly. The upside of having lower-caliber teams is it lets kids play who have been cut elsewhere. Sophomore Newt Fuller considered open enrolling but ended up at Southwest with his friends, so he plays for Minneapolis West. "I like the kids, but it's not the greatest hockey team," Fuller said. "I have a fun time at school and that's what it's about - school, not hockey." Another West player has a friend who went to Benilde-St. Margaret for hockey but was cut this year. So now, the Benilde friend is jealous that his Minneapolis West friend still gets to play. 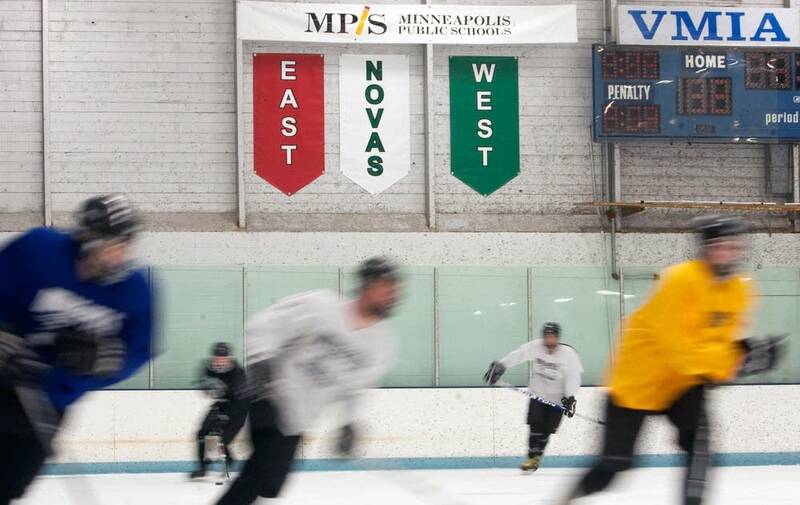 Joe Dziedzic doesn't think there's much hope for a return to the heyday of Minneapolis and St. Paul public school hockey. There's talk of further consolidation - of Minneapolis having only one team next year. St. Paul officials warn they'll also probably have just one team in a few years. But not everyone's giving up. 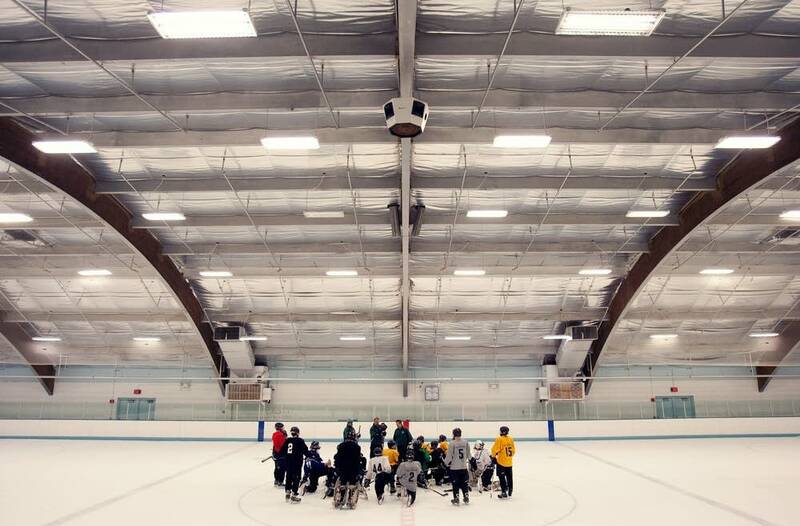 Some coaches note a recent spike in city kids enrolling in youth hockey leagues. The key, says Dan Pratt at Washburn, will be convincing those kids to stay in the public schools after 8th grade. "Can hockey come back in the city? Sure," Pratt said. "But it's going to take some pretty gutsy parents to say 'you're going to stay with your buddies and play there and make the team better rather than running off to a private school or open enroll to some of the suburban schools." Minneapolis West won that game in New Hope Tuesday night, but there was little hope for the in Thursday's game. West faced Minnetonka - a team that's lost just once this year. Minneapolis West lost the game to Minnetonka, 9-0. Two other city teams also played Thursday night and also lost, which ends their seasons. Minneapolis East fell to Wayzata 14-0; St. Paul Johnson lost to Totino-Grace 8-2.